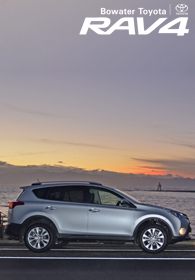 The Toyota Prado; capable beyond comparison. Local retired Wakefield auto mechanic Bob Croy and his mates got together early 2012 to come up with an idea of how to raise more money for the local Cancer Society. They had just completed a successful fund raising effort for the Relay For Life, but wanted to give back more. Being an ex mechanic Bob remembered a previous auction of a rebuild Morris Minor and so the BMG Mini for Nelson Cancer was born. The concept was to raise a large sum of money to be given to the Cancer Society Nelson through the Relay for Life process. By creating a raffle, Bob and his mates (called the Wakefield Caffeine Crew) felt that they could really make a difference, and generate a lot of interest in the project as well as a whole lot of money. The Bowater Motor Group have joined with this motivated team to help support them through this process by donating all of the parts needed to complete the job. Follow their journey as this rebuild takes shape. Alison McAlpine, chair of Cancer Society Nelson and Linda Lucre (Centre Manager) receiving the cheque from the sale of the BMG Mini Trailer from Tony Bowater. We recently had the pleasure of presenting a cheque for $1590 to the Cancer Society Nelson as the final stage of the BMG Mini for Nelson Cancer. This cheque arose from the selling of the custom built trailer that the BMG Mini was carted around on in the promotional phase of the project. This bought the massive project to an end for us as major sponsors of what has to be regarded as a wonderfully successful fund raising campaign. Overall the very hard working Caffeine Crew team from Wakefield, led by ex-mechanic Bob Croy, has raised over $110,000 for the region. The Bowater Motor Group has been an instrumental part of this entire project, supplying free of charge all of the parts needed to completely rebuild the 1975 Mini from the ground up. 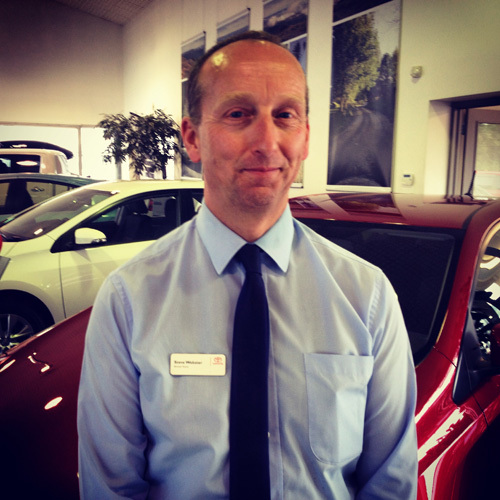 The Parts Department of Bowater Toyota, led by Kieron Reilly, had quite a task sourcing some of these parts, but came through each and every time sourcing sometimes hard to find parts through their extensive network of contacts and associates. 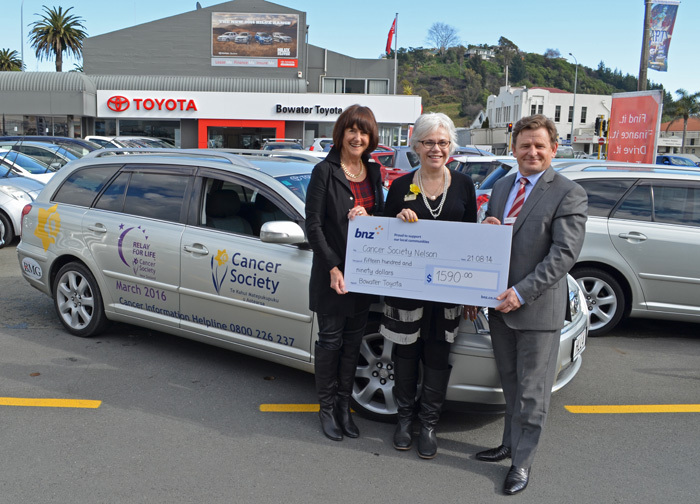 After close to 2 years of hard work, and alot of blood, sweat and tears by all involved with this very ambitious project, the Bowater's team were proud to round off the project with the final donation handover to the representatives of Cancer Society Nelson. Today at 1pm a palpable buzz of excitement descended upon the gathered crowd outside the Wakefield Police Station. This assortment of Wakefield Caffeine Crew members, sponsors, Cancer Society Nelson representatives, and friends of all involved had come together to witness the culmination of several years worth of hard work. Those that attended the Wakefield Police Station for the official drawing of the BMG Mini for Nelson Cancer raffle also witnessed the conclusion of a very successful fundraising campaign, with the prizes drawn at the hands of local officer Senior Constable Peter Cobeldick. The first prize, and the prize dearest to our collective hearts for all of the blood, sweat and tears that have gone into it, was obviously the fully restored 1975 Morris Mini Mark 3. The daffodil yellow car has been a part of our landscape since it first arrived on the scene back in early 2012. 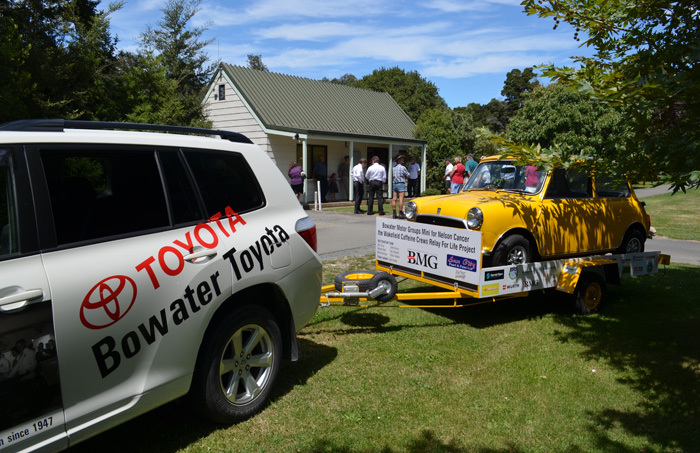 The parts department of Bowater Toyota have had a major part to play in the restoration of this car as they have sourced and provided most of the required parts for the restoration. 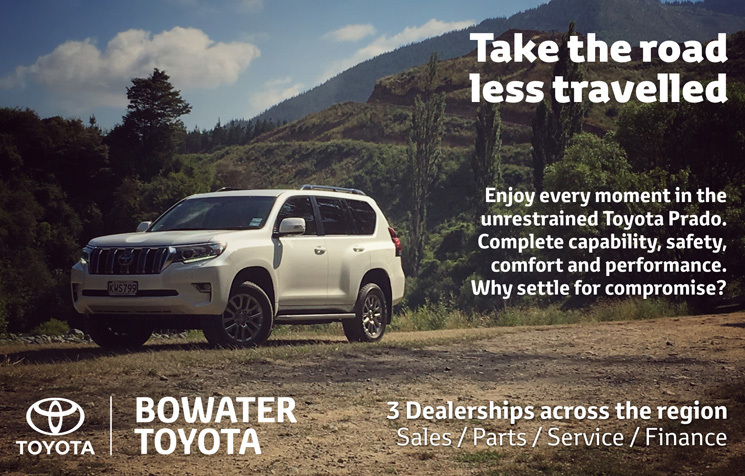 Most of these have been brand new parts; proving that age, make and model are no match for the professional Parts Team at Bowater Toyota. Jan 29 The BMG Mini for Nelson Cancer - a chance to give back, and a chance to be properly involved. Martin from the Richmond Mall with Wakefield Caffeine Crew member, and BMG Mini restorer, ex mechanic Bob Croy. Sometimes you can be involved in a project that is a whole lot bigger than the project itself. The depth of the idea is multi faceted and evolving. In a lot of ways the BMG Mini for Nelson Cancer has taken on a life of it's own as the raffle comes to a close and ticket holders eagerly await the results of the draw at the Wakefield Police station on Thursday 30th January. 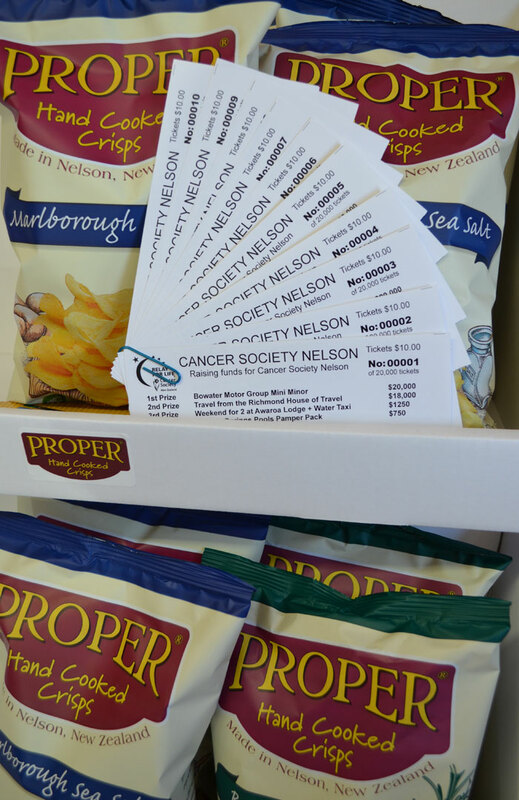 Alot of people, and local businesses alike, have embraced the sentiment of those behind the BMG Mini raffle as they know that they are directly supporting those in our local community affected by cancer, their caregivers, and the Cancer Society Nelson, who do such wonderful work. The end goal of this project has always been about raising both money and awareness for use by the Cancer Society Nelson through their Relay for Life charity fundraiser. This is where the concept was born by Bob and his fellow Relay for Life "Caffeine Crew" team members, and this is ultimately where the money raised will return. One surprise for all involved was the depth of community support that other local businesses have showed for the fund raising. 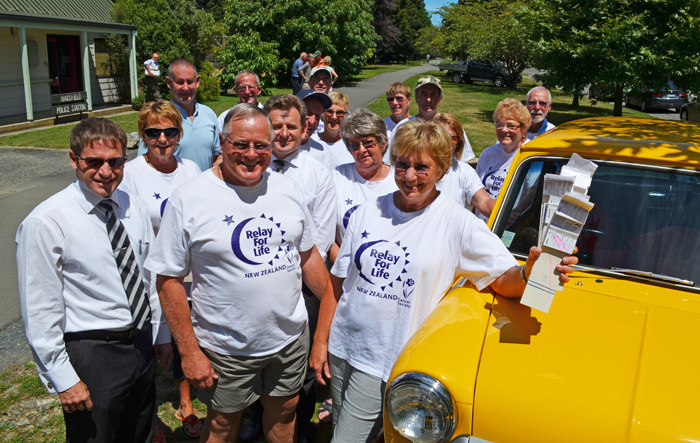 The local media such as the Nelson Mail, and the community papers such as The Nelson & Waimea Weekly's, as well as Wild Tomato and the Nelson Leader have all run wonderful articles following the journey of the BMG Mini for Nelson Cancer. We have been following it's progress closely on our website as well (www.bowaters.co.nz/bmgmini). 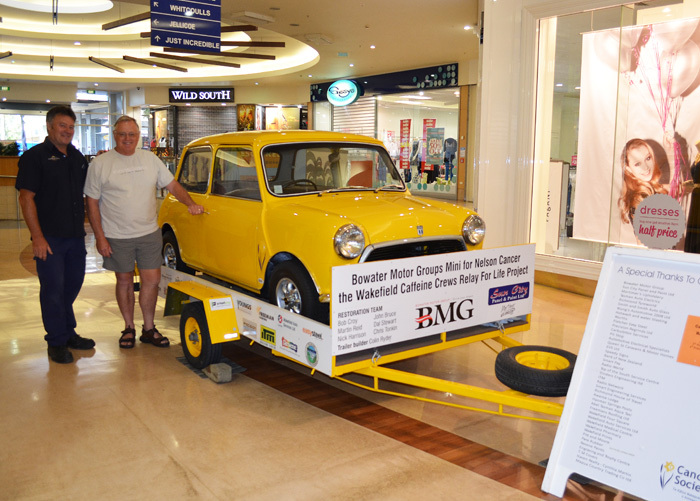 The Richmond Mall and the Bowater Motor Group came together and facilitated getting the raffle ticket sellers into the Mall along with the Mini itself. When the tickets went on sale the project certainly took another turn, with it moving from a purely mechanical one into a more community based one. Everywhere you turned the BMG Mini was there for the 2 months that the tickets have been on sale. Other local businesses were keen to be supportive by buying books of tickets. One such business was Proper Crisps out in Stoke. 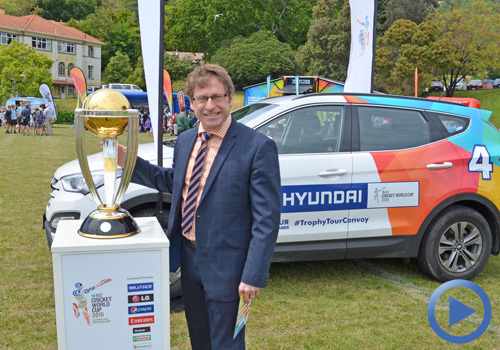 We have had a little bit to do with the Proper Crisps team late last year with our Bowater Toyota Propertunity to guess how many packets of Proper Crisps could be perfectly packed into the new Prado. When they heard about the BMG Mini for Nelson Cancer, the story behind it, and the task ahead, they were "properly" excited, and keen to be involved without hesitation. 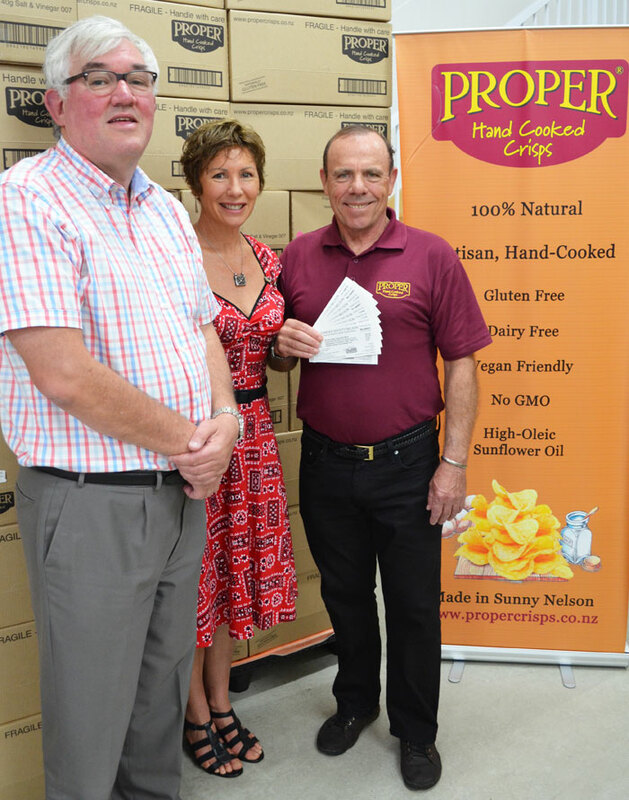 James Bowyer (Proper Crisps GM) with Mina & Ned (owners) of Proper Crisps with their book of tickets. We took a quick trip out to see them in their Stoke factory where their delicious treats are hand made and packaged to be sent around the world. The whole team felt proud to be able to support such a great cause, a cause they felt was so very important because of the huge impact cancer makes on the community, and the sheer volume of lives that it touches. They were also keen to win the BMG Mini - they reckoned the yellow paint job would be the perfect background for their logo to turn it into a mobile Proper Crisp dispensation delivery device! Nov 04 $10 buys you a chance at prizes galore, but more importantly helps someone directly. It only costs $10 to buy a chance in the BMG Mini for Nelson Cancer raffle. A chance to win this wonderful, fully restored mini. Or $18,000 worth of travel as second prize. 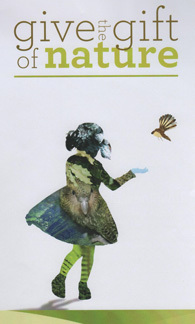 Or 4th prize of a Hanmer Springs Pamper Pack. That is an awesome range of prizes right there for just a $10 raffle. However that $10 is also a ticket to helping someone directly affected by cancer. And that is what it is all about folks. All proceeds from this years Caffeine Crew Relay for Life fund raiser go back to local people via the Cancer Society Nelson. 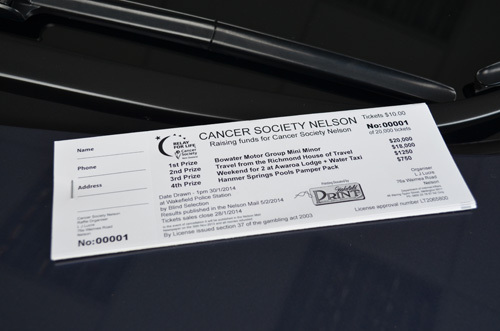 The aim is to sell all of the 20,000 raffle tickets for the BMG Mini for Nelson Cancer and raise $200,000. Tickets are on sale from November 1st through to Tuesday 29th January, with the draw taking place at 1pm on Thursday the 30th January 2014 at the Wakefield Police Station. 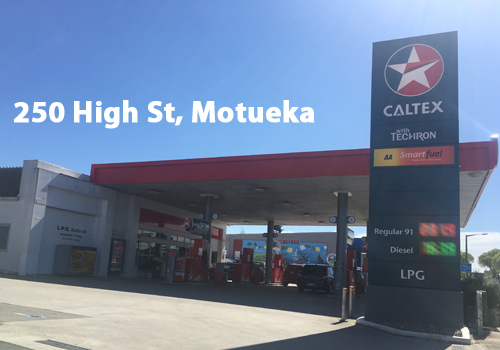 You can pick up a ticket from any one of the 6 Bowater Motor Group outlets around the district. It is time to get the show on the road. We have rebuilt the car now can YOU help us? The origins of a special charity project - why rebuild a mini?